Mmmm… bread. Omg I love them. Especially freshly baked bread… *drool* Sadly, I am unable to enjoy them like I used to because foods like bread, rice, and pasta now just makes me feel weighed down, and I don’t like that draggy feeling AT – ALL. Sooo… I was overjoyed to have stumbled upon this most delightful LOW-CARB bread… I mean, CLOUD BREAD! Only three ingredients… no lie!!! And they’re soooo fluffy aaand DELICIOUS!!! I’ve seen these used for sandwiches and even burgers… we like to spread homemade strawberry or blackberry jam on them (omg… sooo delish!!! )… but usually have them as is because they’re THAT good! 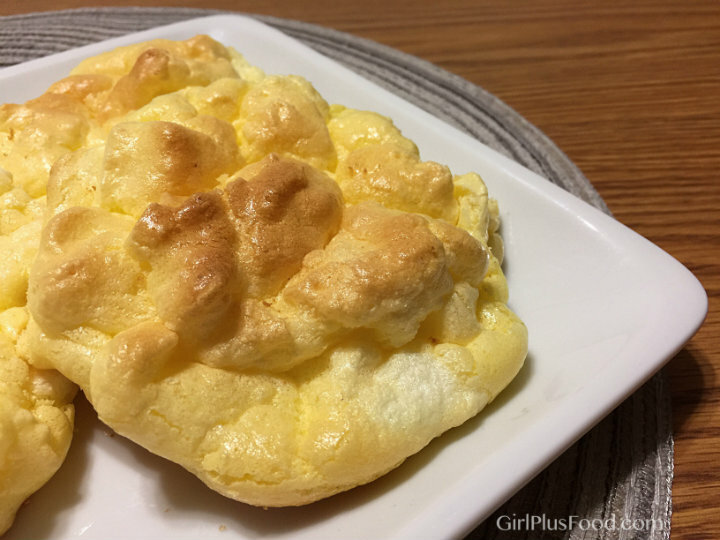 Cloud Bread - Low Carb, Just 3 Ingredients! Very carefully separate the eggs. There must be NO YOLK in the whites. In a medium sized bowl, mix together the EGG YOLKS, Cottage/Cream Cheese and sweetener (optional) until smooth. In another bowl (metal or glass - NEVER plastic for beating egg whites!) add 1/4 tsp cream of tartar to EGG WHITES and mix on high speed until they are fluffy and form stiff peaks. Gently fold egg yolk mixture into egg whites until mixed. Careful not break down the fluffiness of the egg whites too much. Spray two cookie sheets with cooking spray. Scoop the mixture into 10 even rounds on sheets (about the size of a hamburger bun). Bake on middle rack for 30 minutes or until golden brown. Remove from oven and cool on a rack or cutting board. Fresh out of the oven, they're kinda crumbly - like meringue. However, once they're completely cooled, seal them in a plastic baggie overnight... and their consistency transforms to one similar to bread - a softer texture that is nice and chewy. I hope you enjoy it as much as we do… it’s healthy, but it doesn’t “taste healthy”… if you know what I mean!!! So much more like a treat!